Thanks for visiting our site with tips and household remedies to remove urine scale in a toilet and limescale as well. A frequent cause for smelly drains and dirty toilets are urine sediments. We’ll show you how to effectively remove urine scale and dissolve urine sediments in your toilet. 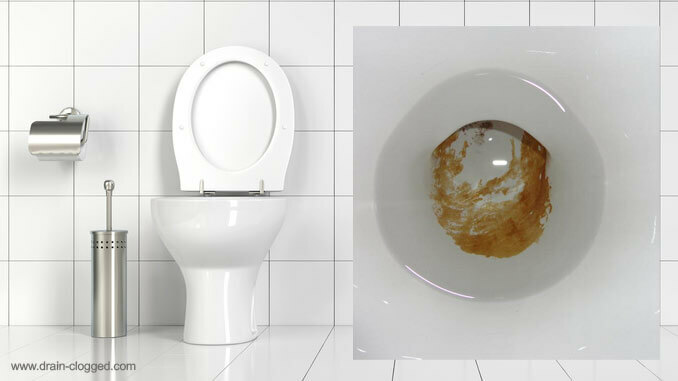 You should try to remove urine scale in toilet bowls right away once you notice sediments in your toilet. They don’t only look unpleasant but are also an ideal breeding ground for bacteria. Therefore, getting rid of urine scale is also important in terms of bathroom hygiene. So if you are looking for answers to “How to remove urine scale / limescale from toilets?” or “Urine scale, what to do?”, look no further. Here, you will find plenty of household remedies that will help you to get rid of urine sediments. Removing tenacious urine scale in a toilet? First, let’s find out what causes it to develop in the first place. Tenacious urine sediments can put toilets and urinals out of order. But how does urine scale develop? In general, urine scale in a toilet arises from a chemical reaction. Urine scale in a toilet forms when urine + water with high quantities of lime reacting chemically with one another. Once this reaction is in full progress it will lead to a yellow-brownish sediment in toilets or urinals – usually in a rather solid form. The lime contained in the toilet water forms a chemical bond with the uric acid and the urine, more precisely a lime and magnesium compound. The solid substances can then be recognized as so-called urine scale sediments. Furthermore, bacteria play a role in the formation of urine scale in a toilet. The longer urine scale remains inside the toilet, the more difficult it will be to dissolve and remove it. Caution: You should always wear rubber grooming gloves when using household remedies / cleaning toilet bowls and urinals. A cheap and effective method for dissolving sediments from your toilet, is using vinegar. Vinegar also efficiently removes urine scale in a toilet. Another advantage: vinegar isn’t only effective against urine scale, but also limescale deposits. You may know this method from cleaning electric kettles. But it also works out well with toilets (and is also a great household remedy for smelly drains). Apply a sufficient amount of vinegar onto a cleaning cloth. You may also coat the toilet brush with it. Spread the vinegar extensively onto the affected area inside the toilet. Allow it to work for a sufficient amount of time. For instance, apply the vinegar onto the urine scale in the evening and let it sit there until the next morning. With this it can take effect and break up the urine sediments. If possible, use another toilet while the vinegar does its job. Then, flush the toilet a couple times and use the toilet brush to remove very stubborn sediments. Often times, urine scale settles in areas that are hard to reach, such as the toilet rim. What you can do to remove the sediments in such difficult areas, is to soak a paper towel or toilet paper with vinegar and stick it under the rim. This way, the vinegar can take effect and break up the urine scale in these areas. Afterwards you can easily remove it. You can also use the toilet brush to get in there. Or go for an old toothbrush or wire brush. It is not a secret that combining Coke with baking soda makes for a strong effect. But please do not mix up this hack with the “Coke and Mentos” experiment! Please do NOT try this as it can cause serious trouble. Here, we only use Coke in combination with baking soda in order to break up and remove urine scale. First, flush the toilet / urinal with water and remove the most severe dirt particles. Then add several spoons of baking soda to the toilet and let it sit there for at least an hour. If the urine scale sediments are very severe please increase the amount of baking soda accordingly. Baking soda contains acids and sodium bicarbonate. Due to this the urine scale slowly starts to dissolve and can be removed quite easily. First, pour some Coke into the toilet / urinal. Then add baking soda (1 to 3 spoons). Foam arises driven by the chemical reaction of Coke and baking soda. This can speed up the process of removing the urine scale from a toilet / urinal. Leave it there for about 1 to 2 hours. Then add some Coke and baking soda onto the toilet brush and scrub the toilet with it. Wait for a couple of minutes. Then flush several times and look forward to the result. An alternative to household remedies for removing urine scale, are chemical solutions (find drain cleaners here). To protect our environment we recommend to always try the eco-friendly options first. However, if you end up being unsuccessful removing urine scale in a toilet with the help of household remedies: There are plenty of cleaning products that might help. You can purchase chemical cleaning products for removing urine scale in every supermarket, DIY store or drug store. You can also try using denture cleanser tablets or dishwasher tabs. Just let them sit in the toilet water over night. Then use the toilet brush to remove the surviving stains. Caution: Most chemical cleaning products for removing urine scale contain chlorine. So please make sure to always wear rubber gloves. And: Don’t allow the product to come in contact with your clothes as it might bleach them. How to prevent urine scale from forming in your toilet or urinal? Flush often! Don’t let urine sit in the toilet. The longer urine stays inside the toilet bowl or urinal the quicker urine scale starts to arise. Clean your toilet frequently. This is the only way to remove sediments right away and with almost no effort. Clean underneath the rim. This is a tricky spot where urine scale starts to develop. Use the toilet brush or even an old toothbrush to regularly clean the rim. Pipes / drains should be cleaned regularly with vinegar or by using special toilet cleaning tabs. They dissolve limescale and also help removing urine scale in a toilet. So always give your best to keep your toilet fresh and clean. The above list of household remedies for removing urine scale and other tips assumes no liability for completeness. In case of doubt, always consult a professional to not risk damaging your toilet. Will useing chemical cleaners in my RV toilet damage my sensors?